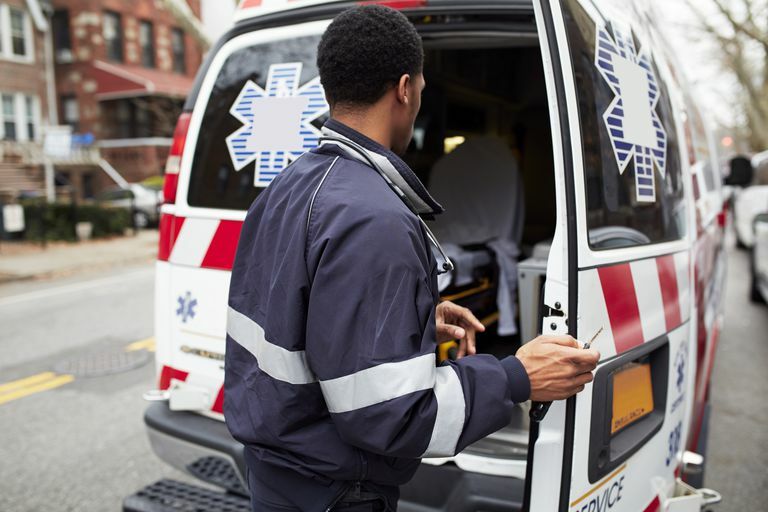 Emergency medical services (EMS) in the United States is cobbled together from various state and local regulations, with variations occurring even between neighboring counties and municipalities. This can make reciprocity (the acceptance of medical credentials) difficult if moving from one state to another. Emergency medical technician (EMT) licensing or certification is handled by the individual states. There is no federal authority, other than the District of Columbia, that governs licensing or certification of EMS personnel. Similarly, each state determines how it will recognize EMTs. There will be at least two levels of licensure—one for an EMT and the other for a paramedic—although others will have more. In term of hierarchy, EMTs are the entry-level providers, followed by EMT-Intermediates (in some states), and then paramedics. While certification requirements can vary by state, EMTs usually require less than 200 hours of training, while a paramedic course may take well over 1,500 hours. Other licenses are issued for advanced paramedics and critical care paramedics, both of which require additional training hours. The National Registry of Emergency Medical Technicians (NREMT) is a nongovernmental organization that maintains a database of certified EMTs. Each applicant must meet a set of requirements, including passing a final exam, before certification is obtained. Many states use NREMT certification to license EMTs, which makes it very easy to grant intrastate reciprocity. As long as you are NREMT certified, you can easily move to another NREMT state. However, not every state takes part in this centralized body. Some create their own tests and standards with a different code of practice for EMT personnel. What this means is that it may be much harder to be granted reciprocity from (or to) a non-NREMT state. If the state where an EMT was first licensed doesn't use NREMT, he or she would need to undergo NREMT certification to work in a state that does. The reverse also applies. It is usually not a difficult process, but it can be time-consuming, particularly if additional training is required. The NREMT offers different types of EMT certification known as EMT Basic (EMT-B), EMT Intermediate (EMT-I), and EMT Paramedic (EMT-P). Reciprocity can vary based on the type of certification granted. ﻿The number of states that don't accept NREMT is surprisingly large. All told, 12 states do not offer reciprocity for EMT-B, 19 do not offer reciprocity for EMT-I, and 13 do not offer reciprocity for EMT-P. In order to be certified in a non-reciprocal state, you may be asked to do an additional training, a refresher course, a practical exam, or a written exam. Some states like Alaska and Connecticut will even require you to have a sponsor for certain positions. In most cases, licenses are good statewide, but some states are complicated. California is one such example. Though the state grants statewide certification to EMTs, local EMS agencies are the ones tasked with handling applications and issuing cards for certification. This creates an additional layer of bureaucracy that can be harder to navigate than some might imagine. For example, paramedics in California are licensed by the state EMS authority but cannot actually practice until he or she obtains separate accreditation from the county or regional EMS agency. To make matters worse, each county or region creates its own standing orders and oftentimes include an expanded scope of practice. This is not to suggest the process is without its rationale or that EMS requirements cannot vary by the community involved. It simply means that any EMT moving to California (or any non-NREMT state) should not expect to walk in and get to work. Preparation will likely be needed. The only way to know for sure if an EMT from one state can be licensed and employed in another is to ask. Contact the EMS agency in the state you plan to move to and advise them of your current certification. They'll be able to guide you on the steps to obtaining licensure in your new state. You can also call the National Registry of EMTs at 1-614-888-4484. National Registry of Emergency Medical Technicians. National Registry Data, Dashboard, and Maps. Columbus, Ohio; updated April 13, 2017.